Transparency Market Research (TMR) has published a new report titled, “Microcatheter Market - Global Industry Analysis, Size, Share, Growth, Trends, and Forecast, 2018–2026”. According to the report, the global microcatheter market was valued at US$ 162.3 Mn in 2017 and is anticipated to reach nearly US$ 304.5 Mn by 2026, expanding at a CAGR of around 7.5% from 2018 to 2026. Rise in adoption of minimally invasive procedures, technological advancements, increase in target patient population are likely to fuel the global microcatheter market from 2018 to 2026. 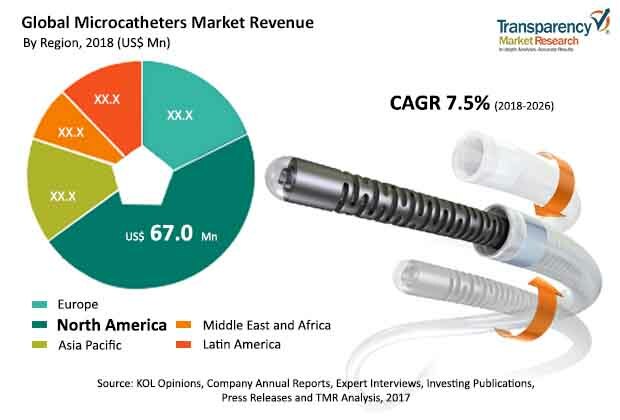 Improved hospital infrastructure in developed markets such as North America and Europe, rise in medical tourism in Asia Pacific, and advantages of minimally invasive procedures are expected to drive the microcatheter market during the forecast period. Increase in the geriatric population, which is prone to neurovascular and cardiovascular diseases, is projected to drive the microcatheter market. According to the National Institute of Neurological Disorders and Stroke, nearly 30,000 people in the U.S. suffer a brain aneurysm rupture each year. In terms of revenue, the microcatheter market in Asia Pacific is expected to expand at a CAGR of 7.8% during the forecast period. Increase in product launches is expected to drive the Asia Pacific microcatheter market. In 2018, ASAHI received chronic total occlusion (CTO) approvals for Corsair Pro Micro catheters and its Coronary Guide Wires to the include MIRACLEbros series, CONFIANZA series, FIELDER series, and Gaia series. According to the World Health Organization, most of the financial burden in health care is the responsibility of governments of countries in Asia Pacific. For instance, in China, more than 95% of health care coverage is under public insurance schemes, which lay emphasis on catastrophic diseases and inpatient services. The report also provides profiles of leading players operating in the global microcatheter market, which include Boston Scientific Corporation, Codman Neuro, Medtronic, Biometrics, Asahi Intecc USA, Inc., Merit Medical Systems, Inc., Stryker, Terumo Medical Corporation, Tokai Medical Products, Inc., and Penumbra, Inc.